A boy napping in the tall grass with his hound. Tigers as wispy as smoke scaling an enormous red expanse. A couple dancing in black in white. The face of pioneering track and field athlete Jesse Owens, multifaceted like a diamond. These are just some of the stories told in paint on the walls of downtown Eugene. These stories didn’t exist a few years ago. 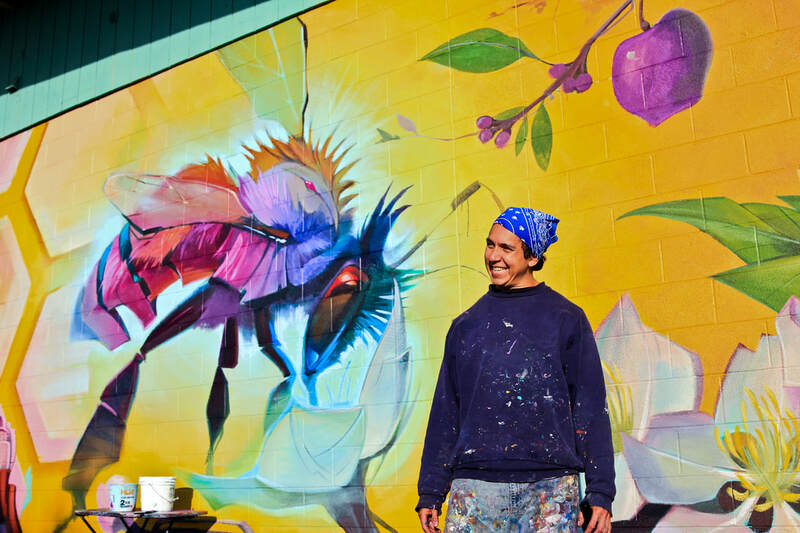 They grew out of the 20x21 Eug Mural Project, a City of Eugene initiative started in late 2015 and channeled through the Cultural Services’ Public Art Program. The vision? To create at least 20 murals by internationally renowned artists before the 2021 IAAF World Championships, the biggest sporting event Eugene has ever hosted. “If Eugene is this place where there are world-class sporting events, there’s no reason it couldn’t be a place for world-class art,” says Thomas Pettus-Czar, owner of The Barn Light and a key player in the 20x21 Eug Mural Project. 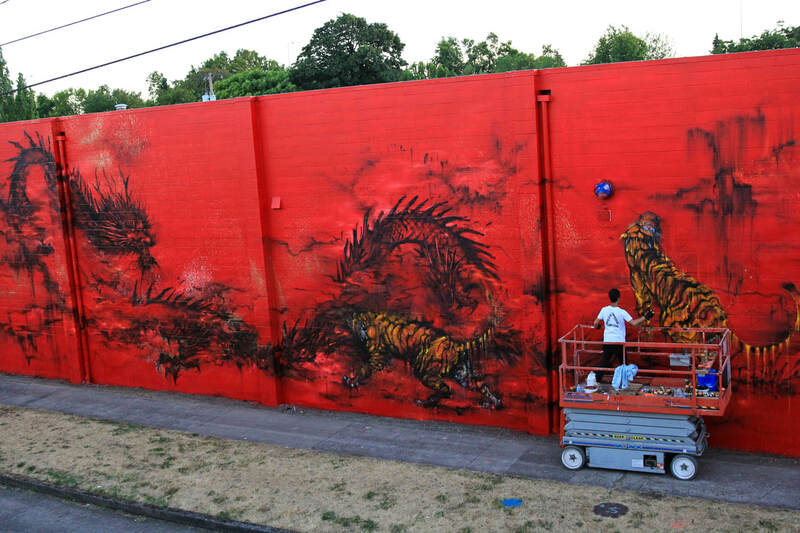 Artists from places as far as Brazil, China, the Netherlands and New York have traveled to Eugene to leave their mark. Currently, 18 large-scale murals have been completed. Gardner also participated in the second “20x21 Presents Eugene Walls,” a week-long mural festival held at the end of July. Joining Gardner were artists Alexis Diaz of Puerto Rico, H11235 of Nepal, AIKO of Japan, Shamsia Hassani of Afghanistan and WK Interact of New York (by way of France), as well as legendary American photographer Martha Cooper. Known for her images capturing the street art scene of 1970s and 80s New York City. Matthew Smalls arrived earlier in the summer to complete his multimedia mural of Jesse Owens on the wall of Urban Therapeutics off Willamette Street. Behind any citywide project is a dedicated team, which in this case, in addition to Pettus-Czar and Bauer, is a committee made up of Paul Denis Godin of Katalyst Resolutions, Joseph Moore of GMA Architects, Debbie Williamson-Smith of the Jordan Schnitzer Museum of Art, Jessica Watson of the Lane Arts Council and the City of Eugene’s Public Art Manager, Isaac Marquez. Pettus-Czar is tasked with finding businesses and property owners to partner with artists and donate a wall for a canvas. “We always allow for the building owners and business owners to approve the image that goes up on their wall beforehand,” he says. The experience has been a positive one for these sponsors as walls with murals typically don’t get tagged or covered in graffiti, a sort of code amongst artists. Many of these business sponsors develop friendships with their partner artists, some even hosting them in their own homes. “It’s been their gateway to art appreciation,” Pettus-Czar says. For more information, and mural locations, visit 20x21eug.com. Interested in Connecting Your Business to the Mural Project?